Travelling further up the road from the Opunohu Valley maraes, we reached the magnificent views to the north and west at Belvedere Lookout. This is the view to the north. 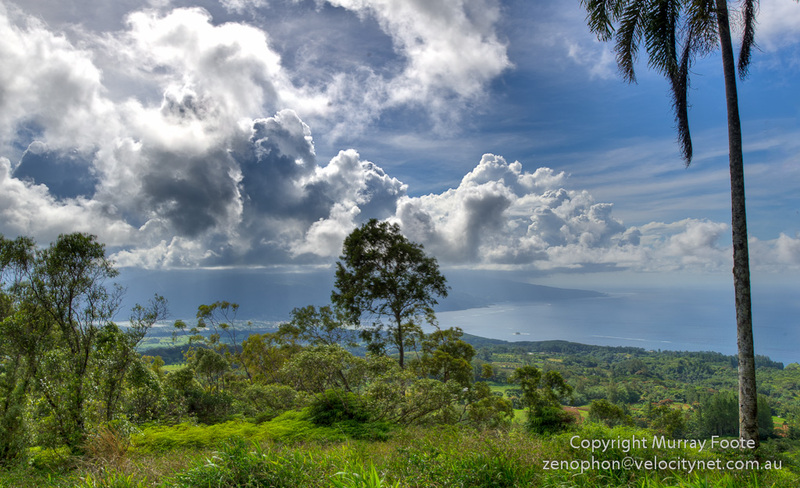 … and this the view to the west. Google maps location (ie showing where the images were taken from). Travelling down from the lookout, we reached this vista as we started to encounter a settled area near Cook’s Bay. Coming out at Cook’s Bay, we continued on the coast road round the island and stopped for lunch near the western most point. Somewhat further on, we encountered the marae above, Marae Nuurua, restored in 1991. As with the maraes in the Opunohu Valley, restoring a marae is one thing, keeping it from being overwhelmed with vegetation may be another. We kept on driving counter-clockwise around the island towards our appointment with the ferry. For a while there were many people out on the roads watching a bushfire in the hills and a helicopter dropping buckets of water on it. This must have been an unusual sight for a damp tropical island. It seemed that both Australia and global warming had come to Moorea. I think some of the “clouds” at the centre left were that smoke. From the same spot, turning round in the opposite direction, we see Motu Ahi. Perhaps you need to click for a larger image to see, but there are huts on a spit at the other side of the island (just poking out at the left). Here is the Lagoonarium de Moorea, which you can go out to on a small boat and snorkel with rays, turtles and nurse sharks – or else just hang out on the beach. Here is a view as the sun goes down and we head back to Tahiti on the ferry. Next morning we flew out back to Auckland and Sydney. We had to get up an extra two hours early at 4am lest we were imprisoned in a traffic jam, even though the distance to the airport was only six or seven kilometres. Should you visit Tahiti, don’t be too sanguine about immediately encountering a tropical paradise. Tahiti itself often seemed more French than Tahitian, though that was no probably in part a tourist illusion since Polynesians are 80% of the population. We were there only for a couple of days in transit. 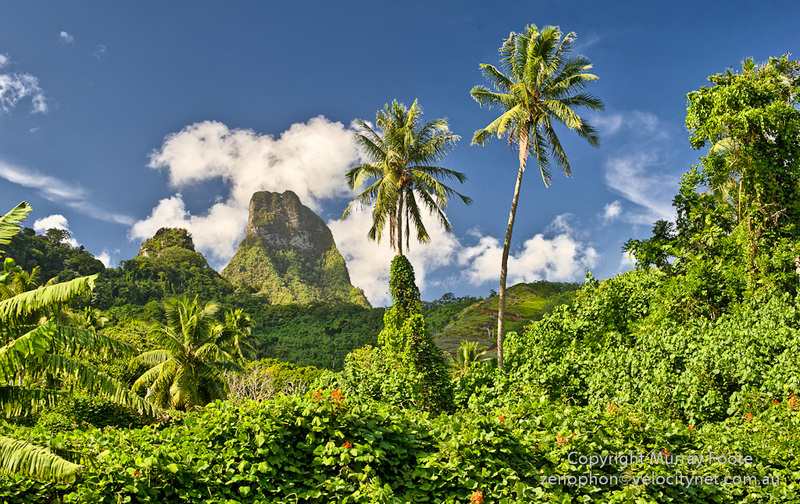 If I were to return, I think I would probably allow two or three days on Tahiti, one full day or more on each of Moorea, Raiatea, Huahine and Pura Pura, plus additional days for travel between the islands. When leaving Auckland, I had to get up even earlier, around 1:30am to catch a 5:30am flight. I was visiting relatives in Auckland and didn’t take any photographs, so this is the last entry for the trip. However, I still have a day in the Falklands to post that I missed and then all the posts for Patagonia, Antarctica and the Falklands to revise, for they were posted on the fly from a laptop and there are also many unprocessed images…. 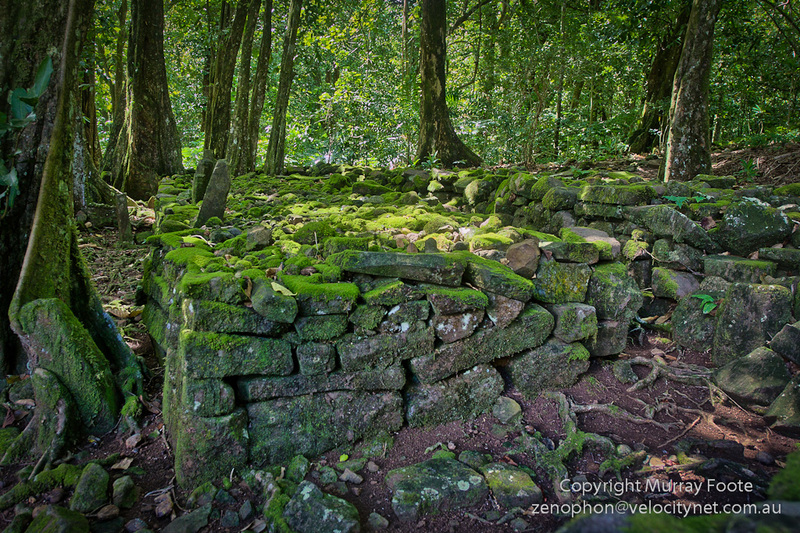 Towards the middle of the day we visited some archaeological sites in the middle of Moorea. Unfortunately it was a bright sunny day which does not help for photographs in a forest. Small marae, a couple of small upright stones at the rear. 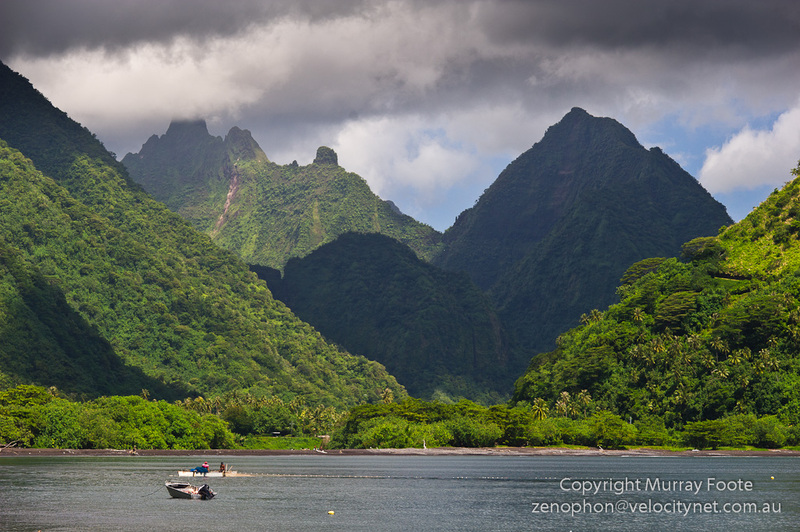 Nowadays in Tahiti and Moorea everyone lives on the coastal strip. In the old days, there was a great population living in the inland valleys. 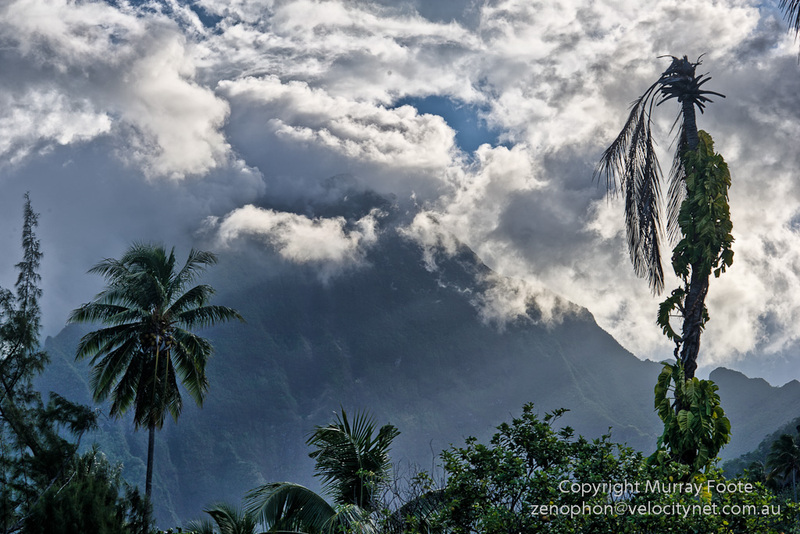 About 500 ancient structures have been identified in the Opunohu Valley on Moorea though not many are visible as the tropical forest quickly swallows most of them up. 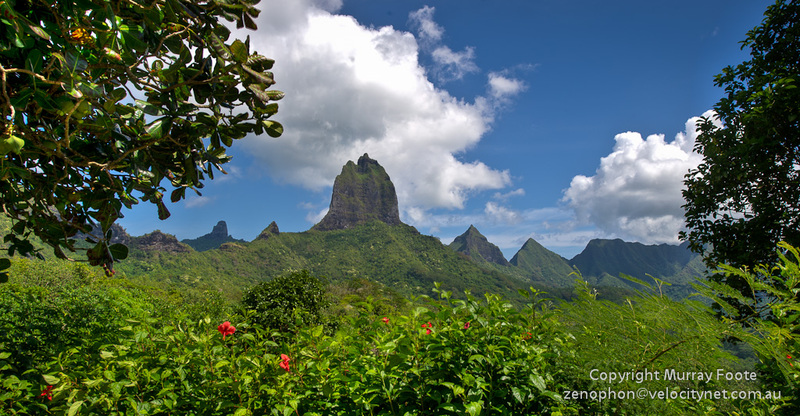 There were 150,000 people in Tahiti at the time of first European contact and 50,000 in Moorea. 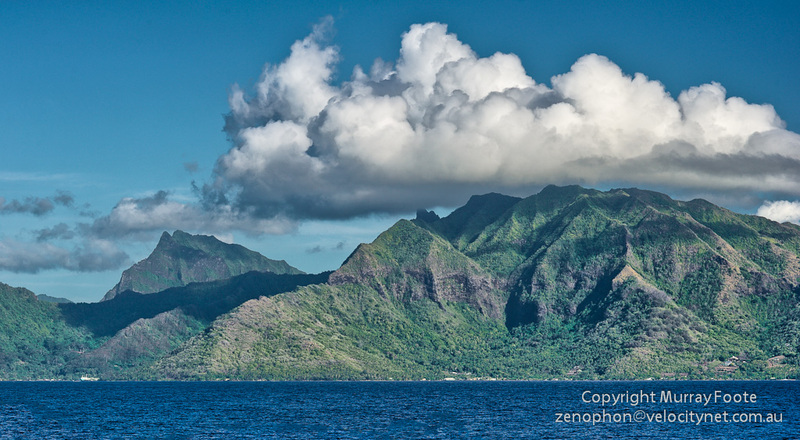 At the time of Captain Cook’s first visit, a war party of 10,000 left Tahiti to attack Moorea. This however, only represented the northern part of Tahiti and the warriors of Moorea were able to deal with it so the Tahiti war party later returned defeated. The functions of priests at maraes included shamanic services. For example, if a woman were pregnant she would pay the priests with goods and food, the priest would enter a trance to commune with the Gods and then provide a guarantee of a successful delivery. There were both larger public maraes and smaller family maraes. Only men were allowed on the maraes (except for some ari’i women (chiefs)) and they could also be places of refuge. For example, there was a stage in funeral practices when the relatives of the dead person could run amok with impunity (to use a Malaysian phrase from a different culture). It was just taken to be a natural expression of grief. Males could take refuge on the marae but women had to hide somewhere else. 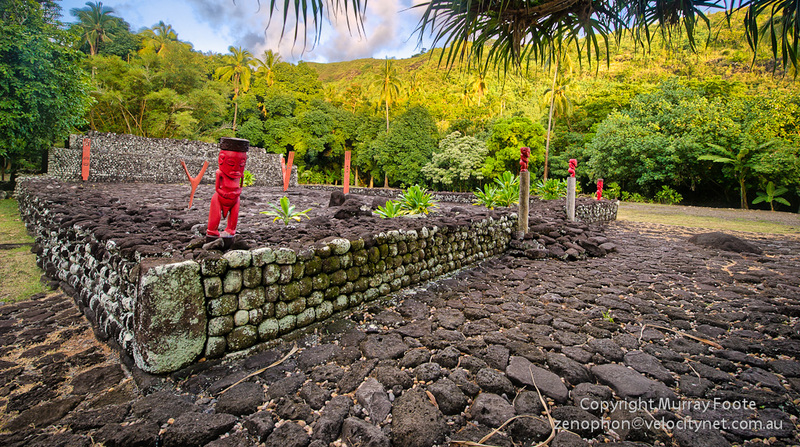 Tahitian society was communalistic with marked social pressures to give things away rather than to hoard them. They had a great variety of natural resources including trees and plants for canoes, huts, baskets, clothes, food and herbs. They had various cultivated crops, pigs and a variety of marine foods from the reef and the open ocean. The Tahitians had an easy life in that they didn’t see the necessity to make any great efforts for their food supplies. Captain Cook left them sheep, goats, cattle and various plant crops. Some such as the sheep died because they were unsuited to the conditions but others the Tahitians did not exploit because they weren’t short of food and the effort required seemed too great. Tahitian social customs were also quite different from ours in many ways. Children, for example were sacred and there were ceremonies that removed this sacredness in stages until they became adults. Objects that they touched, while effectively owned and in use by another person, became sacred and unavailable for use. When the first male child was born, he automatically became head of the family and the father merely the regent. Similar social taboos were also widespread. For example, Cook’s botanist Joseph Banks touched some bread that a woman was preparating (sourced from the breadfruit tree), curious about the process but not understanding the social significance of his actions. This rendered the partly prepared bread unusable so it had to be thrown away and even the woman’s hut had to be destroyed. All this changed with the arrival of the Europeans and the advent of the missionaries. There was also an inadvertant overthrow of the main traditional chiefs. The early visitors anchored at Matavai in the north of Tahiti, which was also the base of those Bounty mutineers who stayed for about eighteen months on the island. These influences and the mutineer’s muskets led to a minor local chief founding the Pomare dynasty over many of the islands. The Tahitians had human sacrifices for occasional special ceremonies but it was not as “barbaric” as that sounds to our modern prejudices. Rather it was a random form of capital punishment. The sacrifice was someone who had committed a crime deemed to be worthy of the death penalty; if no such person was available then no-one was sacrificed. In this, they were much less barbaric than the Europeans of the time. 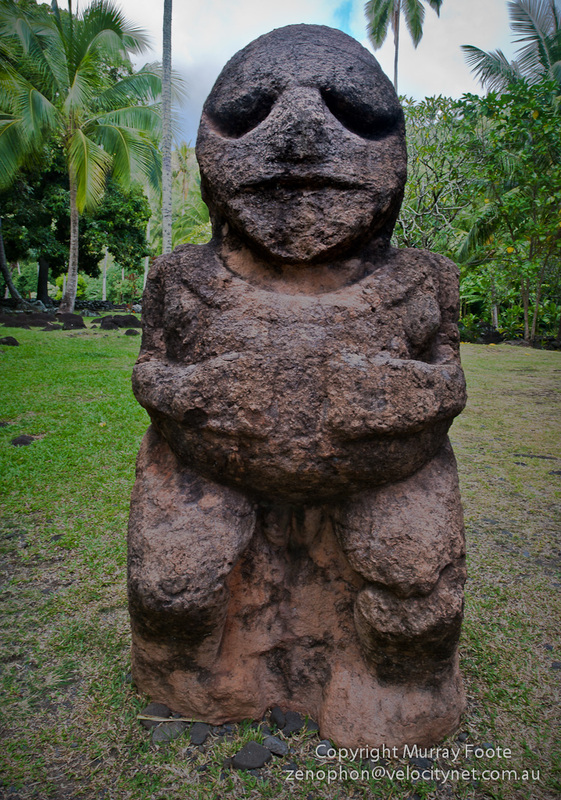 The Tahitians did have singular practices of infanticide which may as a side effect have helped restrict their population from an Easter-Island-like explosion. There were two main causes of this. One was a special society whose members were called arioi which could include people from all social classes. They included both males and females dedicated to a life of full sexual freedom. When a woman became pregnant in such a situation, the baby was usually removed before the mother could see it and killed. The other was procreation across social classes. There were strict codes against this and the babies of such unions were also killed at the time of their birth. It may be difficult to see in the image above, especially in the unfavourable midday light, but you may be able to make out a crescent of green stones in the foreground and a square behind it. 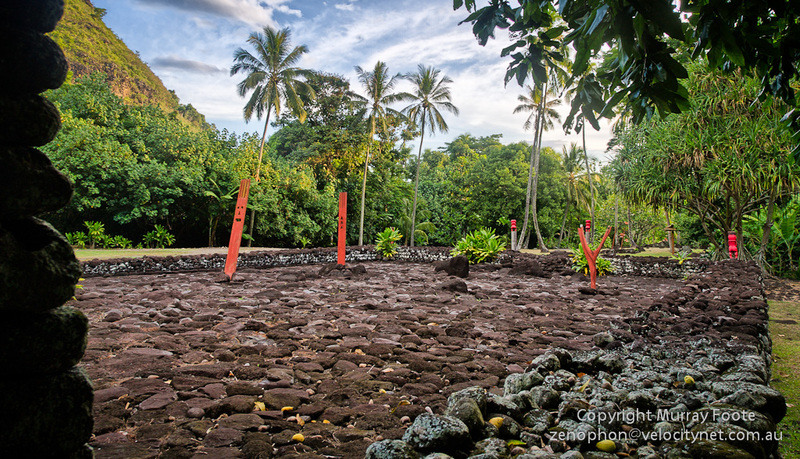 This is the remains of an archery platform, a contest between male ari’i or ra’atira (chiefs), testing strength rather than accuracy. The archer kneeled in the centre of the stone crescent, facing past where this camera would be centuries later. The vegetation was cleared for 300 metres (which in itself boggles the mind) and they shot up the hill. Observers stationed on the hill waved back with flags to indicate how far the arrows went and competitors were eliminated if they did not achieve a minimum distance. Bows and arrows were not used in warfare, presumably so that the chiefs were not unduly exposed to danger and perhaps due to a person-to-person code of honour in warfare. This would put them at a disadvantage against French muskets in the key battle of the 1840s; with archery the outcome might have been different. In my quick searches for information on the internet I haven’t been able to find much evidence of the Tahitians rendering species extinct apart from perhaps a few species of birds. Tropical forests grow back quickly and offer many refuges while the many reefs of the Society Islands offered many little-exploited fish habitats. An arii could also declare a rahui by which a species (often pigs) in a particular location was sacred for a period of time, so numbers could recover. Mind you, the Easter Islanders had something similar and that ultimately proved futile for them. The population density was clearly high and methods of agricultural cultivation were intense. Even so, they don’t appear to have reached a stage of particularly intense resource pressures. However, this may not be so true of the leeward group of the Society Islands such as Raiatea and PoraPora (or Bora Bora). These were islands of dry agriculture (yams and sweet potatoes) as compared to the wet agriculture of Tahiti and Moorea (taro irrigation). In the last hundred years or so before Europeans, the cult of the war-god Oro had replaced the cult of Tane. This came from the leeward group, as well as various military incursions to Tahiti and Moorea. 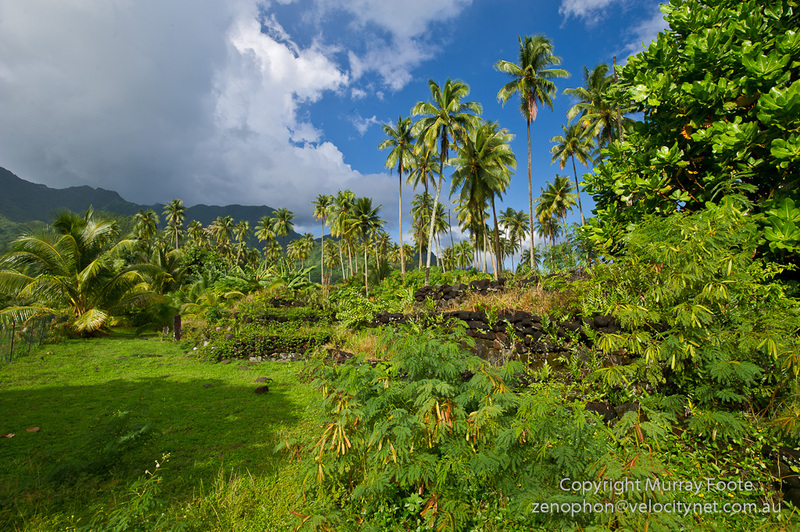 Raiatea was actually the cultural centre of the Society Islands but the belligerence of the drought-prone leeward islands may indicate that they had experienced some degree of overpopulation and resource depletion. 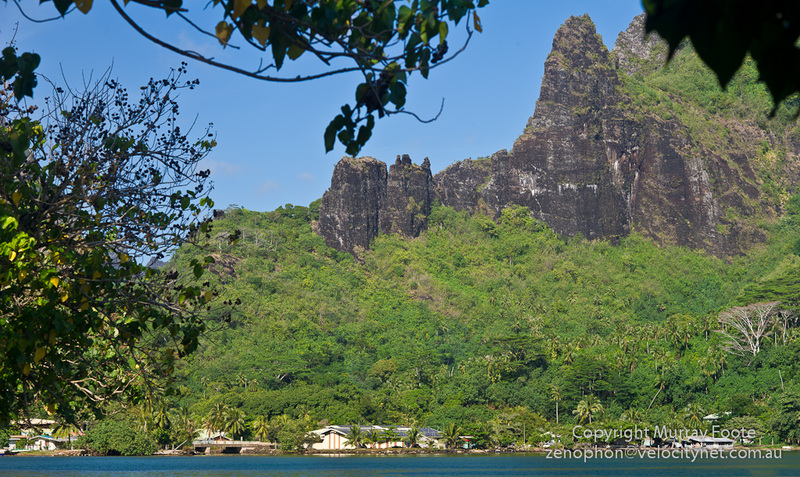 Coming back from Tahiti Iti, we stopped for lunch at a friendly open air restaurant in Taravao, on the isthmus. Following that we spent some time at the Paul Gauguin Museum, which is definitely worth a visit but I didn’t take any photographs. In danger of running out of light, we headed for the Arahurahu Marae, the best preserved or restored marae on the island. On the way we went past Marae Mahaiatea but did not stop there. It was constructed just before Wallis visited the island in 1767 and was the largest marae in Tahiti, incorporating an 11-step pyramid 13.5 metres high with a base 81 by 26.5 metres, fronting on to a square paved area 88 by 81 metres. 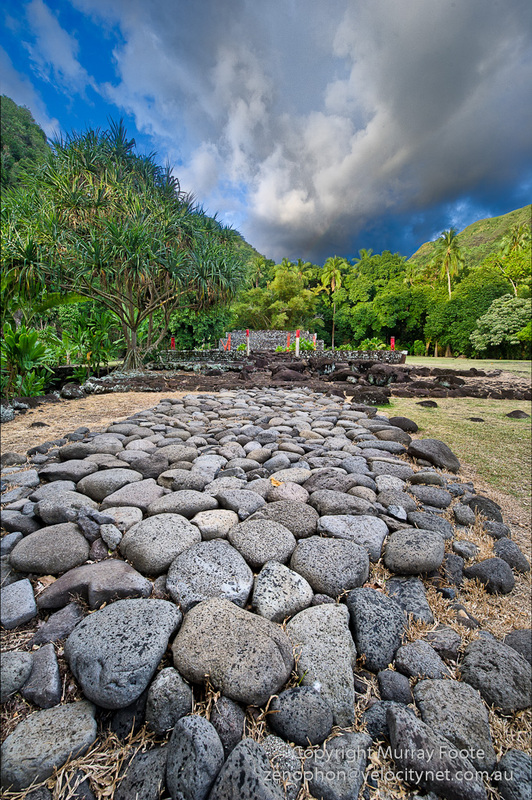 Chiefteness Pura had it built to assist her bid for power over all Tahiti and nearby Moorea on behalf of her young son. By the time Cook arrived a few years later, she had been defeated and power shifted to the clan that later became the Pomare dynasty. That marae would indeed be worth visiting if it were still untouched but these days it is just a pile of stones, having been disassembled by a planter for building materials in the nineteenth century. So we went instead to Marae Arahurahu, which was restored in 1954. This is the entrance. 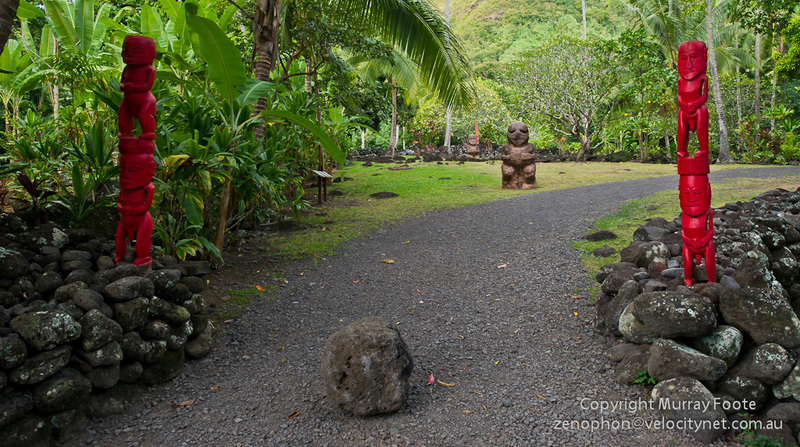 The stone tiki you see on the left is a replica; the original is in the Gauguin Museum. It doesn’t even come from Tahiti, rather from the Gambier Islands. The reason the original ones are not available is because the missionaries did all they could to destroy traditional Tahitian culture. It is female (and the ring from shoulder to shoulder is a necklace). 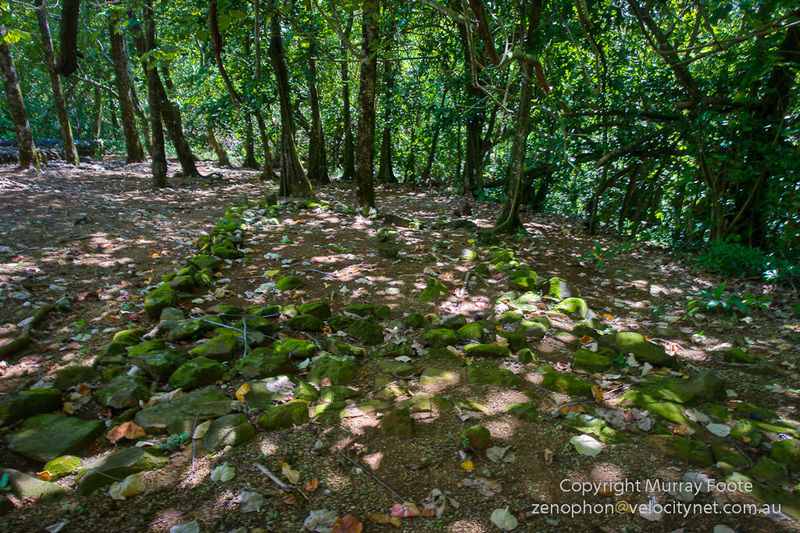 The image to the right shows the traditional stone pathway onto the marae, all the way up to the tahua (sacred courtyard) and the ahu (altar). Of course, you’re not allowed to walk on it any more, you can just look. 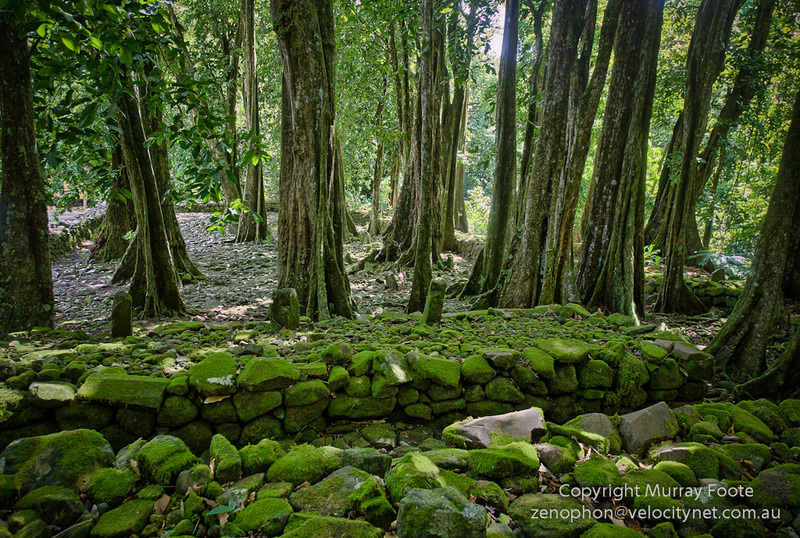 This is a corner of the tahua. 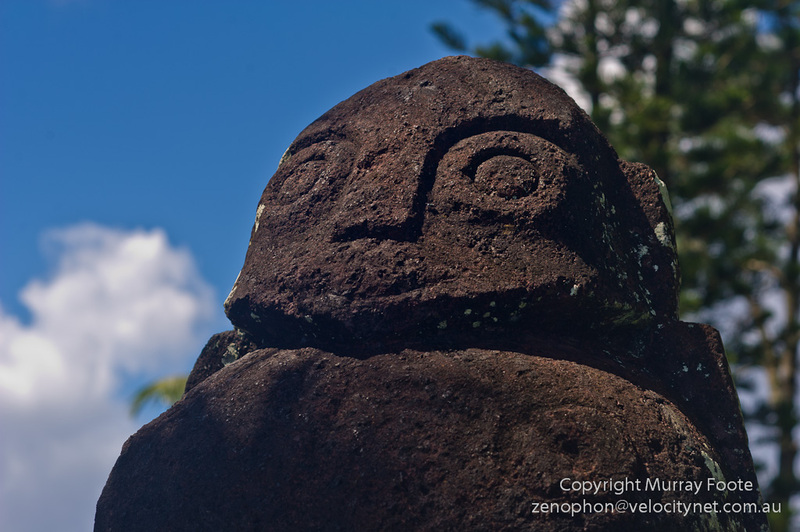 The front figure shows some similarities to the moai of Easter Island. The moai were only carved from the waist up. However, here, as with the moai, the arms are at the sides and the hands meet at the waist. He also appears to have a topknot and the carving of the face shows, I think, some similarities. Over to the right, the raised area is the ahu (altar). There are some similarities with the ahus of Easter Island though they were on a much more massive scale. Of course, you have to go back something like 2,000 years to reach common ancestry. 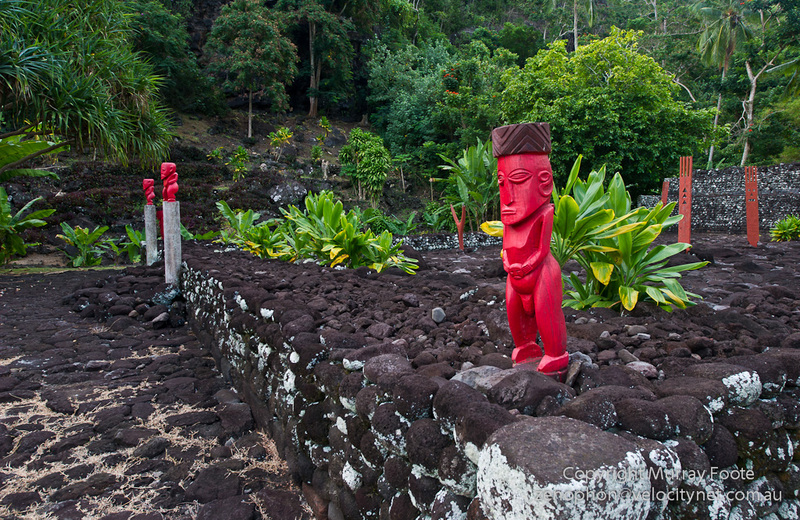 The tahua from beside the ahu. The Y-shaped object was the base for a small platform to place offerings on. 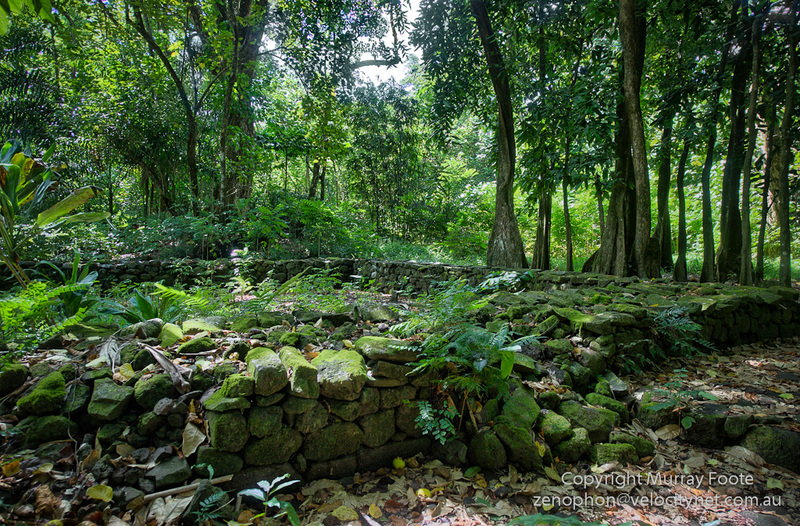 There are mangoes here, scattered on the tahua and tahua walls, fallen from the trees. 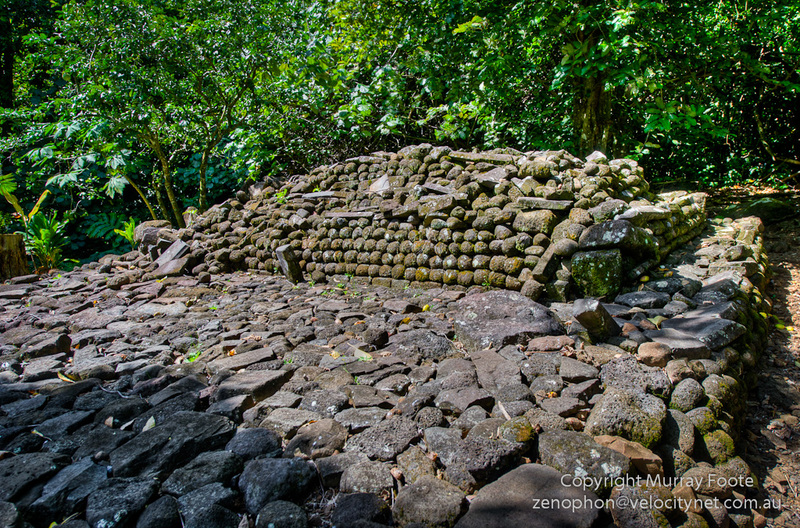 The whole raised square in front of the ahu is the tahua. 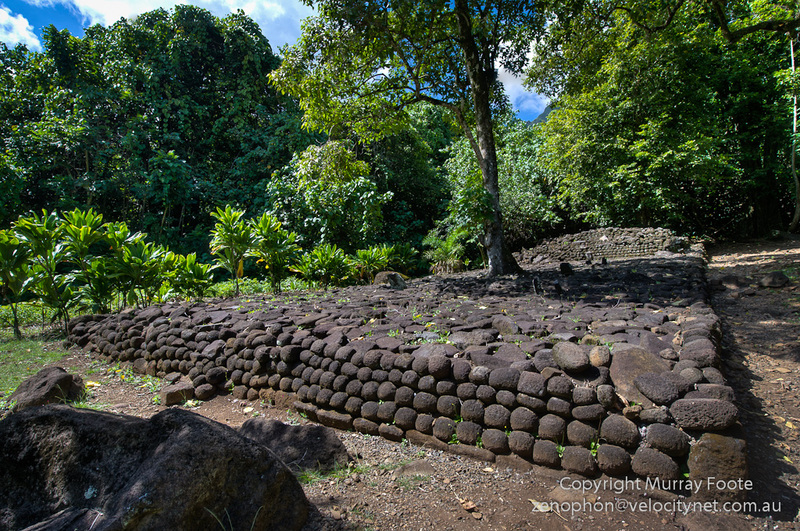 No women were allowed on the tahua except for femal ari’i and their attendants. (Ari’i is chief, same as ariki in Easter Island and New Zealand). Only the priests and the ari’i were allowed on top of the ahu. 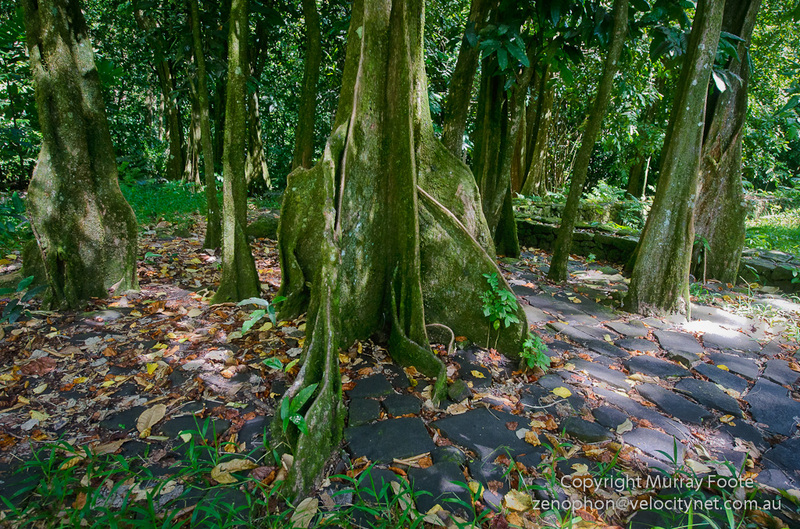 Large numbers of tropical fruit trees have been planted around the tahua. However, whether they were always there or not, this is not entirely authentic. 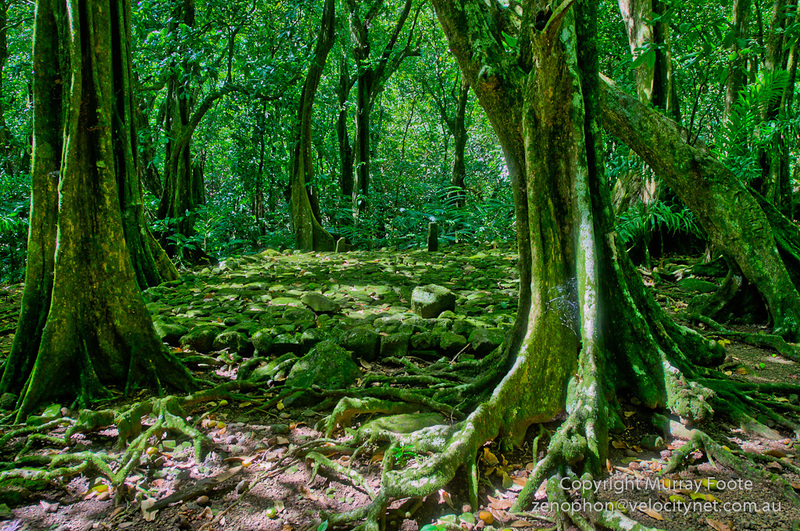 Different trees were planted to make the area dark and mysterious. These included miro, tou, tamanu, ‘aito and pua.